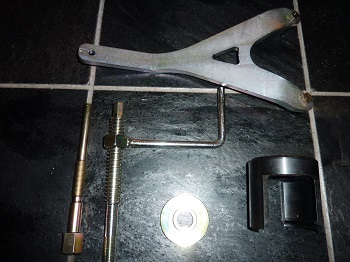 SPI Ski-doo PDrive Clutch tool package- This is the Basic PDrive primary tools need to service the PDrive clutch and if you already have the tools for the QRS secondary clutch. THESE ARE PROFESSIONAL SHOP GRADE HARDENED STEEL PLATED TOOLS- BETTER THAN ANY OTHER TOOLS BEING SOLD TODAY -SLIGHTLY MORE COSTLY BUT BUY ONCE CRY ONCE! -The bundle Includes these PDrive tools, spring compressor,holder, puller, and circlip installer/remover. These are all the tools needed to work on the new PDrive clutch. The SPI compressor lets you change weights without removing the dampener or primary spring which you cannot do with the OEM SKI-DOO tool. These are in stock now and ready to ship!